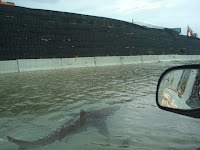 Nigel G. Mitchell - Author, Blogger, Geek: 100-Word Scifi: "Sharkquake"
They looked out of the mayor's office window at the water-filled cracks in the city streets. People screamed and ran as sharks leaped out of the trenches, grabbed citizens on the street, and dragged them under the reddening water. If you're interested, Syfy, I'll be over here.